The first parcel of land donated to the Conservation Trust was the Acker property on Stony Brook. This 15-acre parcel is just downstream from the dam under the Depot Street bridge, sandwiched between the railroad bed and Stony Brook. The trail head is 180 yards in from the Depot Street railroad crossing. A concrete railroad post with the vertically inscribed number “307” is 50 feet before the trail head, and the trail head itself is marked with a hiker medallion on an oak tree. The Acker trail meanders along Stony Brook for approximately six tenths of a mile. The trail is marked with vertical yellow lines on the occasional tree, but the trail is well worn and the path is fairly well defined. Following a number of ice storm tree falls, the trail was impassible in a number of spots up until the fall of ’98. Combined with its relatively obscure entry point, this trail has not had a great deal of use recently. But anyone who ventures down the Acker trail now will not be disappointed. There are great viewing spots of Stony Brook along the way, and of the geese, great blue herons, ducks, and beavers that inhabit this virtually untouched waterway. There is a small beaver dam a short distance from the trail head, which merely slows the water flow and creates a small pond-like basin behind it. A hiker can be startled by the sudden, loud warning splashes the beavers make when they sense danger. Near the midpoint, the trail passes through a cathedral of white pines, where sunlight never reaches the ground so there is no undergrowth. It is a peaceful, shady spot that is in stark contrast with the rest of the woodland. About four-fifths of the way along the trail there is a remarkable reminder of the inexhaustible energy of the beaver. Several huge poplar trees have been felled by beavers. Some have been caught up in nearby trees and are suspended diagonally, miscalculations on the part of the engineers of the animal world. The bark of the poplar is a favorite meal of the beaver, evidenced by a number of the fallen trees scraped clean of their bark. 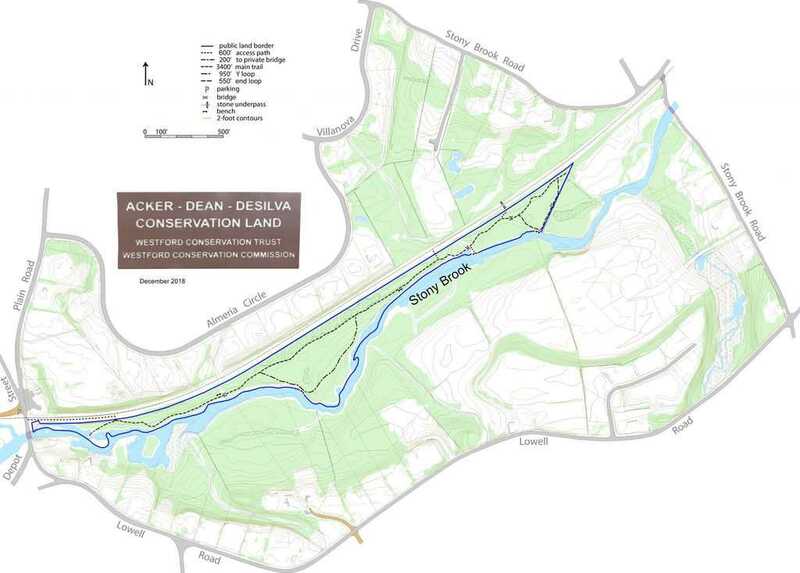 Through the very generous permission of the Dean family, the Westford Conservation Trust has been given access across the Dean parcel that abuts the Acker land. This allows for some terrific scenery, including another beaver dam with a cascading waterfall. The soothing sounds of the falling water combined with the scenic surroundings make this spot a tranquil oasis far from the maddening crowd. Note that a bridge is out but is scheduled for replacement in the near future. The four-foot gap is a giant leap of faith; an easy bushwhack to the tracks bypasses this stream. A short path to the left leads to a 19th century compromise between railroads and farmers. A cattle pass runs under the rail bed, allowing livestock to safely reach the brook. Benches have been added along the way. The trail extends beyond the Dean parcel into the DeSilva land. Altogether this land is clearly a bright jewel in the crown of Westford’s preserved woodland and open spaces. It provides an opportunity to experience nature and its woodland wildlife unencumbered by man, and without having to leave town. The trail head is 180 yards in from the Depot Street railroad crossing. A concrete railroad post with the vertically inscribed number "307" is 50 feet before the trail head, and the trail head itself is marked with a hiker medallion on an oak tree.